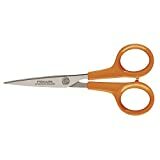 These Fiskars needlework scissors have narrow, sharp tips for precision needlework. The blades are made from stainless steel with a hardness of HRC 57, ensuring long lasting sharpness. Made from Stainless steel Hardness: HRC 57 and are dishwasher safe. Tijeras de gran valor ideales para todo tipo de situaciones. 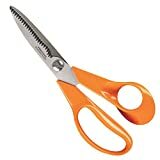 These Fiskars kitchen scissors are ideal for cutting food and opening packages in the kitchen. The serrated blades prevent slipping and keep materials in place. The blades are made from stainless steel, with a hardness of HRC 57, ensuring long lasting sharpness. The blade tension is adjustable. The cushioned, textured grip makes cutting easy and comfortable. Ideal for large cutting jobs. Equipped with an easy-action spring with slide lock and precision-ground blades. 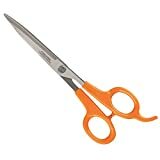 Cut Length: 1 3/4""; Scissor Length: 5""; Tip Type: Micro Tip; Handle Type: Straight. Serrated jaws are able to cut through finer-gauge wires as well as stems. Manufactured to the highest standard using only high quality materials. Designed for the professional and home florist. 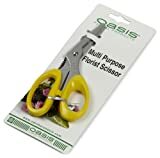 Oasis cutting tools are inexpensive and good value for money. They are easy to find on the workbench with bright yellow signature handles. Universal, suitable for left and right handed users. 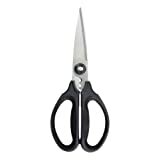 These animal shaped scissors are safely designed for young children and are fun and funky. 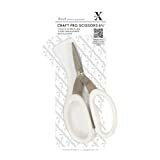 Suitable for both left and right handed cutting, the 5cm blades have rounded tips and are ideal for children's papercrafts and felt. This pair of red Victorinox Kitchen Scissors are designed with comfortable handles for grip and control.The pivot between the blades ensure precision cutting at all times and also allows the scissors to be dismantled for cleaning and sharpening. 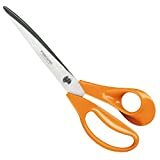 With a Non-stick coating to minimize adhesive build up, a micro-serrated cutting edge and Kushgrip handles for comfort, the Tin Holtz Non-stick Micro-serrated scissors are the perfect crafter's companion. 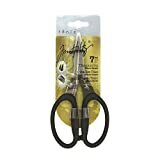 Included is a plastic cap for safe storage, which also helps to ensure the quality and sharpness of the scissors. This is a must have item for all crafters. 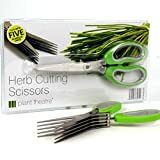 General purpose scissors with micro serrated blades for detailed snipping and non slip cutting plus large comfortable handles for ease of use. Blade thickness 2.5mm, stainless steel blades with titanium coating, scissor length 6 3/4", rubber plastic handle.